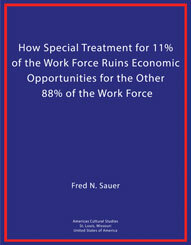 This article was originally posted on National Legal and Policy Center. On May 4, 2008, Missourians For Cleaner, Cheaper Energy filed a petition with the Missouri Secretary of State, Robin Carnahan, to put Proposition C, the Clean Energy Initiative on the November 2008 ballot in Missouri. This proposition created a renewable electricity standard in the state. The standard requires utility companies to gradually increase their usage of renewable energy annually until 15% of the energy used in the state is renewable. This proposition does not result in a trivial sum of money. In the base year, 2011, relevant electricity revenues were $5.032 billion and if electricity usage would grow 3% per year into the future, here are the mandated annual and cumulative expenditures for renewable energy for the following 10 year intervals in billions of dollars. When you see the extraordinary amount of money involved in mandated purchases of renewable energy your curiosity is piqued! Who is promoting this? Well in the case of this Proposition C the largest contributor, who gave $100,000 to promote it, was Wind Capital group. And, what a surprise, its founder in 2005 was Tom Carnahan, whose father Mel Carnahan was a former Democrat governor of Missouri. 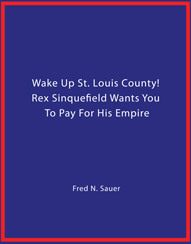 And whose other son Russ served for eight years as Missouri’s 3rd district congressman. One does not have to be cynical to wonder about all these Carnahans and the billions of dollars that Missouri electricity consumers are being compelled to spend on renewable energy. If you want to know how Ameren, Missouri’s largest electric utility spends its money on non-renewable energy, their SEC regulated annual report will tell you all the details about revenues, expenses, and returns to their stockholders. Under Proposition C, the same Ameren is supposed to produce an Annual Compliance Report, regulated by the Missouri Public Service Commission, on how they complied with their mandated purchases of renewable energy. But here we hit a stone wall! The Missouri Public Service Commission has permitted the critical data to be redacted from the report. The simple reality is that trying to discover how money flows to windmills and who gets what money is like a black hole. Thus renewable energy sort of has the attributes of a Ponzi Scheme. Missouri voters were understandably happy to vote for “cleaner and cheaper” energy. Who wouldn’t be? And if what they thought, that cleaner and cheaper energy was really being provided, why would the Missouri Public Service Commission have allowed essential financial information to be redacted from Ameren’s compliance report. Yet, you cannot find out anything about who or what are receiving, at first hundreds of millions of dollars, and eventually billions of dollars that renewable energy producers are getting from everyone who uses electricity. Electricity prices are going up and up. Thus mandated purchases create a very regressive “tax”. Is any renewable energy cheaper or cleaner? Was proposition C’s title completely misleading as presented to the Missouri Voter? And who approved the language of the ballot summary? 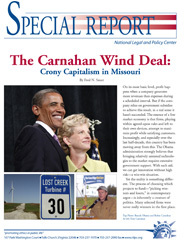 The Secretary of State Robin Carnahan, whose brother could have been the beneficiary of compelled renewable energy purchases through his ownership of Wind Capital Group. Robin Carnahan should have recused herself from having anything to do with Proposition C’s ballot summary. 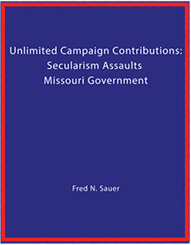 On June 6th, Fred Sauer filed a lawsuit against the Missouri Public Service Commission to make them unredact the detailed sections of Ameren Electric’s Annual Compliance Report so that the citizens of Missouri can obtain transparency about what is happening to all the money they are paying in artificially high renewable electricity prices and who is getting it. An over-hyped, if not irrational ideology about carbon dioxide causing global warming. 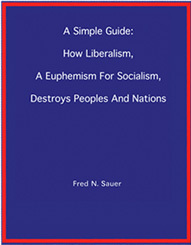 It is propagated by too many Democrats like Al Gore and President Obama. It results in a massive transfer of wealth from all users of electricity to owners of renewable energy producers. There is a calculated lack of transparency and obfuscation in the flows of money. Too many recipients of stimulus money and loan guarantees, and owners of production facilities are either Democrats or supporters of Democrats like Warren Buffet, Elon Monk, and Missouri’s Carnahans. Forget the Ponzi Scheme, the better question about renewable energy would ask, if it is not an extremely sophisticated fraud pouring out the U.S. Treasury as payola for those favored by the democrat regime.